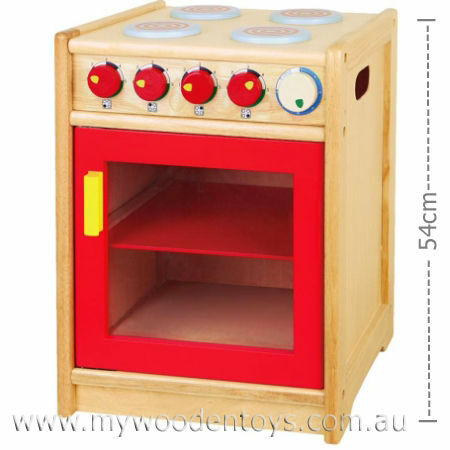 Wooden Oven with Stove Cook Top is a beautifully made piece of kitchen toy furniture which will add a huge amount of fun to any culinary roleplaying. Your little ones kitchen will now have an oven with opening door, sliding shelf and rotating heat control knobs. The door is also perspex so you can see all the wonderful things you have cooking. A great toy which will last and last. Material: Wood, Child-safe paint, varnish and perspex. We like this because: "It's the perfect size and your little one really feels like they are cooking......fantastic!."